Google Maps and Bing Maps provide an amazing collection of aerial views that may be appropriate for very low resolution purposes. However, compare the images below to gain an appreciation of the benefits that Pictures From The Sky can provide. - The images could be very out of date – several years in some cases. - You may not choose the time of day or even the time of year of an image. - Resolution of the images for most professional purposes is not acceptable. - If you need a progressive portfolio ( for instance a weekly shot to illustrate building construction) it will be very difficult and expensive to persuade Google to move their satellites for your shot. Pictures From The Sky eliminates these restrictions by allowing you to schedule and participate in the shoot. All images are perfect for professional purposes. And obviously, should your requirements include video, there are very limited and expensive alternatives. Remember, the images below are simply for illustrative purposes. Google Map and Bing Map retains all copyright to their images. 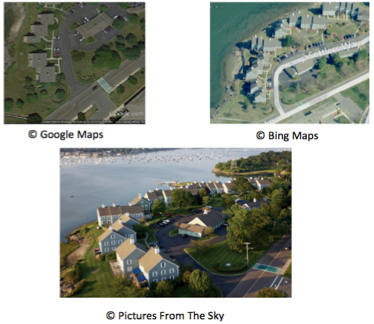 Here is an illustration of what is available from common aerial picture sources and from Pictures From The Sky. This is a group of homes in Salem, MA.